There will not be a Parents as Partners meeting on Monday, April 30th. Instead, parents are invited to attend a screening of the documentary "Angst: Raising Awareness Around Anxiety". Screening are at 1 PM and 7 PM in Memorial Hall's Auditorium. Admission is free. To reserve seats, please call 308-432-6302 or email sfrench@csc.edu. Please click the link to access the 8th Grade Elective Application for next year. The deadline is May 4th. The High School Physicals are scheduled for Wednesday May 2, 2018 at 7am. 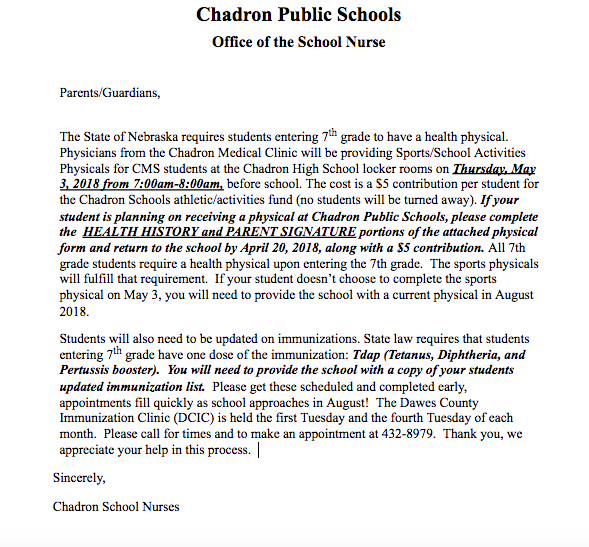 The Middle School Physicals are scheduled for Thursday May 3, 2018 at 7am. If the form is not completed and signed by the parent/guardian, the student will not receive a physical. All physicals will be done in the High School locker room/concessions area (north side). 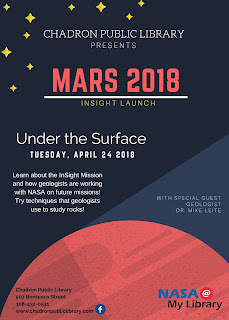 WHAT: Don’t miss a fascinating planetary geology event! Chadron Public Library will be celebrating the upcoming Insight Mission to Mars launch. 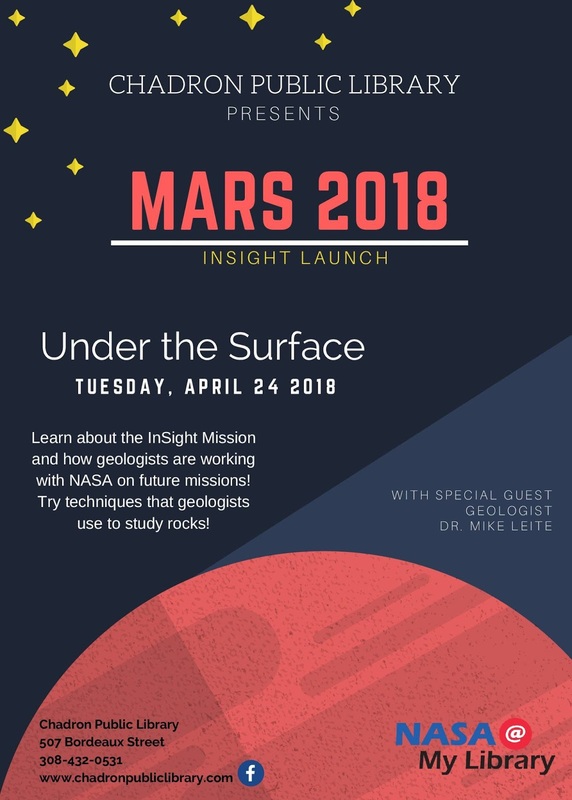 Dr. Mike Leite, Geosciences professor at Chadron State College, will talk about upcoming Mars missions and how student research is contributing to NASA planetary science and exploration. There will be some fun hands on activities including making edible models of planets and examining rocks similar to ones scientists expect to find on Mars. All ages are welcome, and space is limited. WHY: Chadron Public Library is one of 75 public libraries selected to be part of the NASA@ My Library initiative to engage public audiences nationwide in informal and lifelong learning with the excitement of NASA exploration and discovery. As a NASA@ My Library Partner, Chadron Public Library is offering free programs and activities for various age groups that explore NASA science and technology. The programs will be held between May 2017 and October 2018. More information about upcoming events will be available at www.chadronpubliclibrary.com and on the library’s Facebook page. WHO: NASA@ My Library is led by the National Center for Interactive Learning (NCIL) at the Space Science Institute (SSI) in partnership with the American Library Association (ALA) Public Programs Office, the Pacific Science Center, Cornerstones of Science, and the Education Development Center. Funding comes from NASA’s Science Mission Directorate via cooperative agreement No. NNX16AE30A. Any opinions, findings, and conclusions or recommendations expressed by NASA@ My Library do not necessarily reflect the views of the National Aeronautics and Space Administration. The MS track meet in Scottsbluff/Gering has been rescheduled for Monday, April 16th at 3:45 PM. Busses will leave at 12:30.